True Story: I’m a mermaid! Last summer I planned part of my 9,000-mile roadtrip around a visit to a mermaid bar. I’ve seen the Weeki Wachee mermaids and the Denver Aquarium mermaids. So when Carla emailed me I couldn’t interview her fast enough! If you, too, are a fan of mermaids, this post is for you. Hi! I’m Carla, thirty-something proud multipod from the UK who loves magic and firmly believes you shouldn’t have to stop imagining just because you’re an adult. After discovering the concept of a portfolio career five years ago, I shifted out of a soul destroying job in the city to create my own career mix. It’s ever-evolving, but currently includes a stationery subscription company, a mermaid school for adults, coaching and photography for small businesses, body positivity and related photography, and a day job in web and marketing. How did you get interested in mermaids? There’s a vivid memory of finding my first video of modern mermaiding during a lunchbreak at my dull City job. I was spellbound, and determined to try it for myself one day, whatever it took. I love the power and grace mermaids have – not least because I am also much more graceful underwater (! ), and I think they are a wonderful symbol of women in their element. I think a lot of people (cough, me, cough) would just be like “Mermaids are cool! I’ll go see them when I’m in Florida!” and that’s where it ends. What nudged you into actually buying the tails, taking photos, etc? Ha, excellent question! I have a lifelong history of throwing myself enthusiastically into new interests that catch my attention; it’s a common multipod trait and mermaiding was no different. It took me ages of plotting, dreaming, scheming and journalling to actually get round to finding some like-minded people online. Once I found the UK pod of existing mermaids, I couldn’t be stopped! It seems to be growing really quickly over here which is amazing. I love having international mer friends but there’s nothing quite like having like-minded people close by, especially to swim with. I eventually bought my first tail as a Christmas present to myself last year. It seemed like a perfectly natural thing to do, though I think most people I spoke to at the time thought I was completely nuts. It remains one of the best decisions I’ve ever made (alongside adopting my kitties and leaving London!). Where does one buy a really good mermaid costume? It depends what you want to do with it! Fin Fun Mermaid in the US (and me, Run Away Days, in the UK/Europe) sell fully swimmable, realistic fabric tails with fins you can swim in. They’re buoyancy neutral for safety and come in a range of sizes and colours. These retail around the £140 mark in the UK, slightly less in the US (damn import taxes!) and are what I use for my mermaid shoots and parties. The tail part is swimsuit fabric so is really comfy to wear! If you’re serious about your mermaiding, you can buy custom made full silicone tails from a number of suppliers – do your homework as quality varies and these are a serious investment of £1200 upwards. Do you swim with your tail? I absolutely do – that’s what I started out to do, and it feels like flying underwater – it is indescribably freeing, and it’s the best cure for a bad day I know, especially if you can find some other mers to swim with! Difficulty varies on the tail and your own competence as a swimmer. You need to be reasonably confident, but provided you have safety precautions in place (a buddy, not swimming in deeper water than you can cope with, etc). It’s not dangerous and it’s a wonderful way to exercise and de-stress. My first time, I sat on the edge with my fin in the water as you’re meant to, and it felt so natural I skipped the getting-used-to-the-feeling-of-the-tail part and just shot off underwater – I’ve rarely swum without my tail or fin since! How do you feel when you’re in mermaid-mode? Do you feel like a different version of yourself? Yes! I create alter egos for myself both for fun and as part of my businesses, and my “mersona” is both me and a tweaked version of me. It helps with the escapism part of the hobby, and it definitely helps when children come up to you on the beach and demand to know if Ariel is your cousin! You host mermaid parties. Tell us what that looks like! I wanted to bring this amazing feeling to other people, so I started Run Away Days with that in mind. Essentially, it’s total escapism for a day or an afternoon. 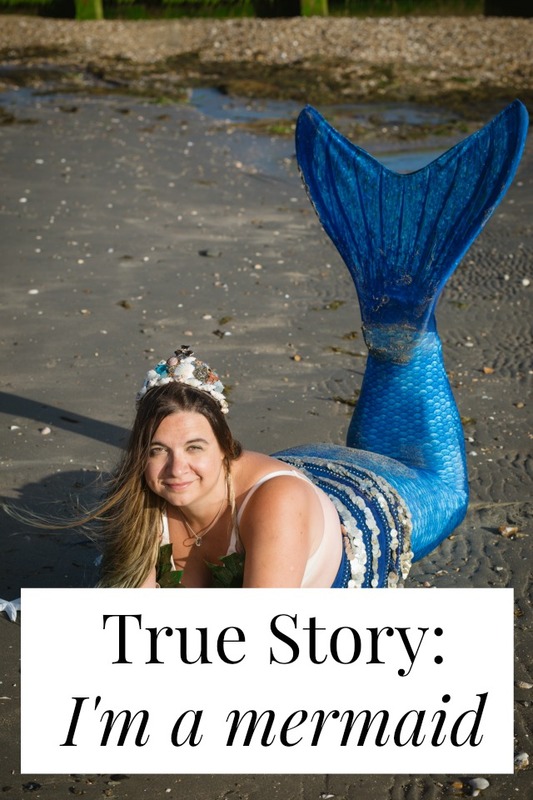 We start with choosing a tail for the day and mermaid crafting – making shell bras and mermaid tiaras or jewelry to match each person’s tail. Crafting is interspersed with afternoon tea or lunch, and cake (obviously). Each new mermaid then gets an individual photoshoot in her creations and her tail, we have some group shots, and then after a safety briefing we get in the pool and learn to swim! Venue dependent, I’ll often try and take some underwater photos with a GoPro as well, and the swim session is a mix of some focus on posing and performance, mermaid workout moves, and just messing around and enjoying the experience of being a real life mermaid. For individuals, smaller groups or people who aren’t that good at swimming, I’m also introducing mermaid photo shoots, which take place away from the water and which I’m very excited about. How do the people in your life react to your mermaid-ing? I get a few double-takes and the odd person who asks why (to which I always reply “why not?”) but generally the people in my life have been incredibly supportive. My friends and family have been 100% behind me since I very first started. They’ve giggled with me about phoning the local pool to ask for mermaiding permission, turned up at mermaid flashmobs, and encouraged me to set up the business and bring it to a wider audience. 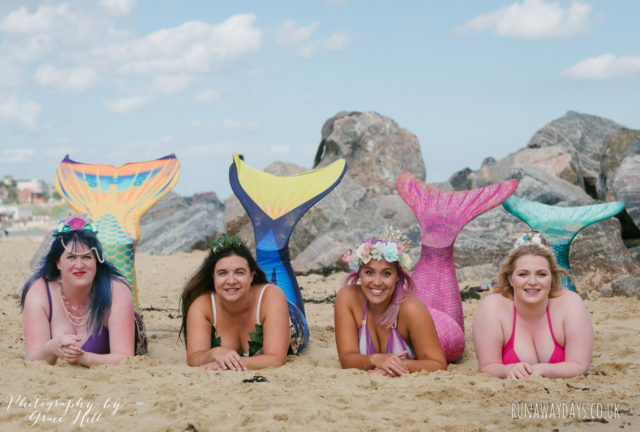 A group of us recently did a body positive mermaid shoot on a local beach and were absolutely mobbed by people of all ages – not one negative comment all day, which made us all happy! It sounds trite, but you can do anything at all that you want to – even if it seems impossible at first. When I look back at that first video I saw of a professional mermaid, it seemed so far away it was laughable. And now I get to swim in a tail whenever I fancy, and introduce other people to this unique, slightly mad, but wonderful pastime. If I can become a real life mermaid, you can definitely do whatever it is that’s calling to you! Also, but no less importantly, mermaiding and the community has reinforced my view that your body type/shape/weight shouldn’t have any impact on you doing the stuff you love. Don’t wait until you look a certain way before trying something you think you might love. P.S. Interviews with a Furry and a burlesque performer! I love this. I’ve been really into RuPaul’s ‘Drag U’ recently, and it’s got me thinking that I need a little more fantasy and pizzazz in my life. Carla is definitely embodying those traits! Thanks for another unique, thought-provoking read! This is great! I did a mermaid photoshoot last year for my blog and loved it. Mermaids are cool and nothing is impossible. Yay! “Nothing is impossible” – words to live by! Do you swim in the ocean or mostly in pools? Or both? Also, I just wanted to say (and I hope this comes out right) that this interview was so interesting for me in my own response to it. When I saw the title in my blog reader, my initial reaction was … well … let’s say it was less friendly and inclusive than I know I can be when I’m being my best self. But then I read the interview, and I loved it. “Why not?” indeed, Carla. We all have different ways to relax and escape and it’s interesting to read about people seeking happiness in different ways. Thanks for reminding me to be more open. I so appreciate your honesty and I love that this interview changed you mind a little, Helena! MERMAID IS TRUE OR NOT?